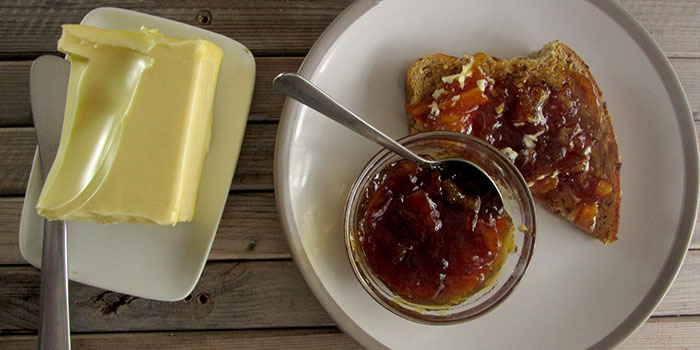 There was a time when toast and marmalade were on every British breakfast table (and in every Paddington Bear sandwich), but its popularity has been declining. However, that doesn't make it any less wonderful. It's quite easy to make your own, and a great way to use up orange peel. Wash the oranges and lemons, and cut them in half. Squeeze out the juice and save any pips. Scrape out the pulpy flesh from the oranges and lemon and place that and the pulp onto a piece of muslin (cheesecloth). Tie the corners up to make a bag. Cut the peel into strips about 5mm (quarter of an inch) wide and 12mm (half an inch) long. Place the peel, water, and bag of pulp and seeds into a large saucepan and bring to the boil. Cover and simmer until the peel is soft enough to crush easily between your thumb and finger - this may take an hour or two. Alternatively, you can do it in a pressure cooker in about 20 minutes. Remove the muslin bag from the pan and put it in the fridge to cool down. When it is cool enough to handle, squeeze the bag over the pan contents - this liquid is high in pectin which will help your marmalade set. Add the sugar to the pan and heat on medium heat, stirring frequently until the sugar is completely dissolved - you don't want to feel any granularity at all. Add any additional perctin, if using. Now bring the pan to a fast boil and keep on boiling until the temperature reaches 105° C (221° F). If you don't have a thermometer, you can test for a set by placing a small plate in the freezer beforehand. Put a spoonful of the liquid on the plate and let it cool. A skin should form, and when you push it with your finger, it should wrinkle. Remove the pan from the heat and let it cool somewhat. Ladle marmalade into sterilized jars (you can sterilize jars by boiling them in water for 10 minutes). It's ready to use as soon as it is fully cool, and it will keep for a very long time. The video above is from the Keef Cooks YouTube channel. Click here to see the video recipe of Orange Marmalade on YouTube. Prep time: 20 minutes. cooling/setting time: 1 hour. Total time: 3 hours 20 minutes.